Turkey's biggest solar plant to be built by Kalyon-Hanwha Co.
At the tender for the Karapınar Renewable Energy Resource Area (YEKA), where the largest solar energy power plant in Turkey will be established, the Kalyon-Hanwha Group consortium submitted the lowest offer of 6.99 cents per kilowatt-hour (kWh). Delivering a speech after the conclusion of the tender, Energy and Natural Resources Minister Berat Albayrak described the Karapınar solar power plant as "a mega project in energy," highlighting the $1.3-billion investment. 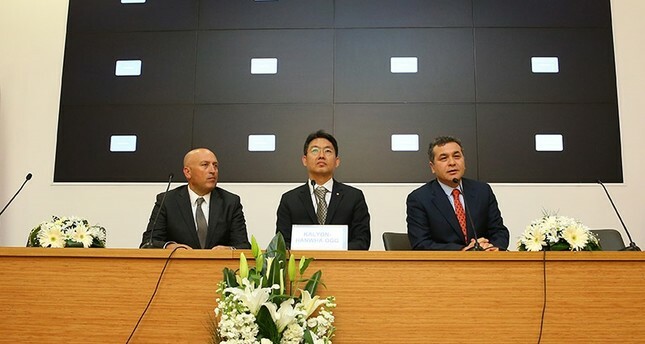 The consortium of Limak-CMEC-Hareon Solar, the consortium of the Kalyon-Hanwha Group, the consortium of Çalık Enerji-Solargiga and the consortium of the AKC and Güneş participated in the tender for Karapınar YEKA, which is to be built in the Karapınar Energy Specialized Industrial Zone owned by Energy and Natural Resources the Ministry. At the tender, where the price cap per kilowatt was set at 8 cents, the Limak-CMEC-Hareon Solar consortium's first submitted offer was 8 cents per kWh, while the Kalyon-Hanwha Group's first offer was 7.95 cents. AKC and Güneş consortium offered 7.98 cents per kWh, while Çalık Enerji-Solargiga Group's first bid was 7.99 cent After the withdrawal of the AKC and Güneş consortium in the 19th round of underbidding, the Kalyoncu-Hanwha Group consortium submitted the lowest bid of 6.99 cents per kWh. Previously, the AKC and Güneş consortium had offered 7.05 per kWh in the 18th round of underbidding. The electricity generated from a 1,000-megawatt power plant, which will be constructed by the winner of the tender, will be evaluated over the purchase guarantee price offered for 15 years. Moreover, 100 permanent technical personnel will be employed at the Research and Development (R&D) center, which will be established within the scope of the power plant. Electricity production from the plant will start within 36 months after the equipment production plant is established. Within the scope of the Karapınar solar power project, a plant with a production capacity of a minimum of 500 megawatts of photovoltaic modules per year will be built in Turkey and a capacity of 1,000 megawatts will be allocated to the Karapınar YEKA on the condition that research and development (R&D) activities will be carried out for the next 10 years. The photovoltaic modules to be produced in the factory, which is to be built in the 21 months after the contract date, will be used in the field. The Karapınar YEKA-1 Solar Power Plant tender will be the first practice in the energy sector to be based on the condition of localization and YEKA-based price determination. Addressing the tender participants and the press following the tender, Energy and Natural Resources Minister Berat Albayrak stated that an investment exceeding $1.3 billion will be realized with Karapınar Renewable Energy Resource Area (YEKA) project. "Today we have witnessed a revolutionary day in terms of Turkey's energy sector," the minister said, stressing that an important step has been taken with this tender in solar energy. A very critical intersection, Albayrak noted that this area will pave the way for an energy sector that Turkey can use to compete with the world, adding that a similar bid will be held in wind energy in the coming months. Albayrak said he defines this as a "mega project" and that they have spent a lot of time working on it. Stating that a very important step has been taken in solar energy, which serves as a critical intersection in renewable energies, Albayrak said, "We have taken an important step in order to realize a project that will shed light on the future period of the country with a tender model and a strategy that will develop Turkey's capacity to export both cheaper and better quality and latest technologies from its domestic resources." Pointing out that they have witnessed a competing race of investors from different countries, Albayrak explained that at the end of this tender, the Kalyon-Hanwha Group was crowned the winner with an offer of 6.99 cents per kWh, and a huge investment commitment both in terms of Turkey's renewable energy and in terms of solar energy and market in the region. According to Minister Albayrak, beyond an investment that will exceed $1.3 billion, a process that produces technology in solar energy in Turkey and will be both evaluated in the domestic market and exported to the region by realizing the R&D investment has begun. "I think this area will pave the way for an energy sector that can compete with the rest of the world because in the coming months we will hold a similar tender in wind energy," Albayrak said, highlighting that the development of these and similar investments in Turkey with technology will provide very important services to the ideal of Turkey's growth. Pointing out that this type of investment gives a very important message in terms of the size of the Turkish economy and the energy sector in Turkey, Albayrak said, "When we look at the economic value of the result while holding these tenders, a very historical picture emerges." He also added that the price policy implemented with the promotion of electricity generated in solar energy up to now, which was applied as 19.5 cents depending on the use of domestic equipment over 13.3 cents purchase guarantee, has fallen to 6.99 cents with today's tender, revealing a historic achievement of almost a third of the figure. Solar energy offers significant opportunities for the Turkish economy, but Turkey, the second in Europe immediately after Spain in terms of solar energy potential, has been unable to fully develop this potential to date. As of March 2017, the installed power of 820 megawatts of solar energy accounts for 1 percent of total electricity in the country. This tender is the biggest initiative ever made for solar energy production in Turkey. The 1,000-megawatt solar power plant to be established will be Turkey's first large-scale licensed solar power plant and will be an important step for Turkey to mobilize renewable energy potential. Hanwha is one of the largest business conglomerates in South Korea. Founded in 1952 as Korea Explosives Co., the group has grown into a large multi-profile business conglomerate, with diversified holdings stretching from their original business of explosives to retail to financial services. Hanwha is providing practical solutions to real-world challenges, including sustainable energy, affordable housing and wider access to financial services. In the energy sector, Hanwha Q CELLS is now the number one solar cell manufacturer in the world. Recently, it signed a record-breaking 1.5 GW solar module supply agreement with NextEra Energy Resources in the U.S.